I love tapas. When I go to dinner I enjoy trying a few different things rather than settling on one entrée. Tapas are perfect! Everyone gets to sample multiple dishes. This roasted mushroom dish is really simple but full of good things like exotic mushrooms, garlic, shallots, chile oil, thyme and goat cheese. The flavorful mushrooms are best served up on crusty bread. The Perfect Pairing for this recipe is a Spanish Rioja red wine. Riojas are probably the most popular Spanish wines. They are primarily made with Tempranillo grapes. It has a bright, fresh flavor that goes really well with this savory mushroom dish. Preheat the oven to 425 degrees F. In a large bowl combine the mushrooms, olive oil, garlic, and shallots. Season with salt and pepper. Lay mushrooms in one layer on a heavy sheet pan. Roast in the oven for 15 minutes, or until tender. 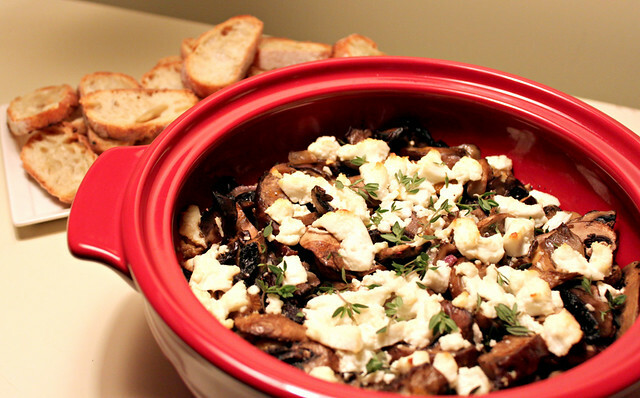 Transfer mushrooms to a baking dish and drizzle with the chile oil, then top with crumbled goat cheese. Bake until the cheese is hot and starting to brown, about 15-20 minutes. Remove the mushroom mixture from the oven and garnish with the thyme leaves. Serve with crusty bread.